Looking at Teety Tezano one can only concur that talent is hereditary. She is the daughter of legendary Cameroonian musician Johnny Tezano and is walking in her fathers’ footsteps. Seeing his daughter’s love for music,her father offered her a piano after she completed primary education and she has been horning her skills ever since. She released her first single “Super girl“in 2006 which was an instant hit. In 2008, her budding talent caught national attention when she and her group “Kat Girls” were named best Cameroonian hip-hop revelation during “Couleurs Urbaines”. She earned another accolade in 2011 when her song ‘Unstoppable” was used by a mobile communication company for one of its ads. 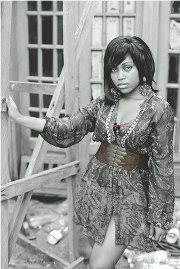 Her music is a brilliant mélange of soul, r’n’b, folklore, reggae and Congolese rumba. She recently featured in the shoot for Krotal’s “La-bas” video. With her sights set on musically acclaim,we can only wish this Cameroonian sweetheart all the hits talent can offer. Below is a sneak peek at her “Super girl” video.